The term Access Control System conjures in a mind an image of high tech secure premises with restricted entry. However, access Control System ranges from the most basic to highly complicated biometric-enabled secure devices. The standard lock and key is the most basic form of an Access Control System. However, over the years Access Control System has evolved to include the elements of modern technology and have multiple aspects of computing and security built into it. Godrej, a well-known name in India, is a leader in security lockers. This time it has come with an Innovative idea of introducing CCTV cameras. Yes, Godrej has finally launched its most awaited CCTV camera range. When Godrej finally decided to mark its entry in the CCTV market, it is not coming with just a single camera. Godrej has launched multiple CCTV cameras. All different from each other in every aspect. The only feature common among them is that they all belong to Godrej; hence they are reliable and trustworthy. Their pixel range is also good enough, offering upto 920x1080,to enhance user experience. Have a look at some of the latest CCTV camera range innovated by Godrej. We are living in an era where technology has taken over everything. There is hardly anything left that technology has not touched. Anyways, this is not bad at all. As, it has assured us more security, helped us saved money and effort both. And the biometric door lock system is one such good inception of the modern technology. This kind of door lock system offers higher level of security while it is affordable and non-intrusive as well. With Women's Day just around the corner, it is extremely important to appreciate the achievements of women and encourage them to participate in the things that they like. Women are no longer sitting at homes; rather they are bagging top positions in multinational companies along with running a healthy household. We hear news about how women are taking over the world, however, the sad reality of life is that an equal amount of crimes against women are also reported every single day. Women empowerment is increasing day by day and so is women’s abuse. This comparison is the harsh truth, but this women’s day let’s make it a point to reduce this injustice towards women at our own level at least. We cannot expect the world to change, but we can help bring some change for our mothers, sisters, and daughters. Gone are the days when advanced security equipment's would burn your bank account. In recent times, many companies have stepped up to the growing safety concerns of homeowners, delivering them unmatched home security solutions at never-before price. Security is a growing concern around the globe today. With the increase in theft of valuable information to apprehension about the protection of people and property, businesses are becoming aware of the need for enhanced security. Hence, to improve the security of residential buildings, business facilities, or public places, one of the best decisions is to use turnstiles so as to control access of employees and visitors. Requirement of video door phone systems has increased a lot in last few years due to the amplified expediency and security measures. With the unceasing progression of residential projects, the usage of video door phones has also been increasing consistently. Nevertheless, customers do not entirely comprehend what a video door phone system delivers or how to pick a video door phone whose features would satisfy all their security needs. Always trust your instincts, when it comes to the safety and security of your family. And CCTV cameras are a great way to keep your family protected. You may have a number of questions in your mind like do I need security cameras in my home? Will it affect the privacy of my home? What are the main parts of the house where security cameras are needed? Are there some susceptible areas in my house? Not so many days ago, a residential high rise in London caught fire which led to massive destruction of property, people lost their homes, many got injured and some could not escape on time, thus losing their lives. Though it happened during the wee of hours of morning and people were fast asleep, many lives could have been saved if they had a proper escape route. No achievements in technology are perceptible if it cannot assure security. We being a leading distributor of security appliances and security based products feel delighted to present the most considerable range of security solutions. The company is proficiently dealing within a number of trusted brands for security devices worldwide. The company feels proud in offering the most comprehensive and convenient range of smart and safe solutions in the security industry. Tailgating is considered to be one of the most common and serious security breaches across the world. This process starts out without any harmful notion and as a kind gesture. This could be in the form of an employee holding the door for some other employees or visitors. It is also recognized as a passive entry of some uniformed employee or worker. There could be several reasons of the event of tailgating to occur. A home security alarm system might seem complicated at first, but it is very simple to understand. The basic units of any security alarm systems are sensors and control panels, the rest comes later. The biometrics recognition system for attendance includes the automated methods of recognizing an individual’s unique personality on the basis of certain behavioral and physiological characteristics. The biometrics attendance system makes use of the famous techniques and technologies like the fingerprint scanner, face recognition, voice recognition, and so more. Amongst all the features, some of the most common characteristics that are used for attendance management include the measurement of the face, hand geometry, fingerprints, retinal, iris, handwriting, voice, vein, and so more. Without a shadow of doubt we all will agree that technology and digitization has bestowed us with so many gifts which have made our lives serene and pain less. One of such blessings of technology is the evolution of CCTVs that are designed to put a blockage on the current growing rate of lawlessness and illegal activities. But as it is said that there is no such thing as a free lunch, the same applies here as along with benefits, it possesses few drawbacks also. There is a constant debate going on over the advantages and disadvantages of the CCTV cameras in the present scenario of society. How Surveillance CCTV Cameras Can Enhance Commuter’s Safety In A Public Place? With the growing crime rate and soaring rise of attack of the solo gunman, hidden train bombs and suicide bombers, the need for strengthening the security surveillance system is crucial than ever. The issue holds utter significance when it relates to the lives of thousands of people in a public place. Apart from these issues, the fateful road incidents that happen on every other day can be lowered and safe driving can be promoted with the help of this modernized safety system. Installing latest Surveillance system is a must to track the crime process and getting the convicted punished. Turnstiles are an effective security solution to your access and control plan. Often installed in public transport stations, stadiums, factories, and warehouses, these gates serve the purpose of crowd management efficiently and ensure safety of the location, and convenience. Turnstiles installations at factories also have the provision of attendance management along with the securing the premises. Undoubtedly, turnstiles can be used on many other errands and can be custom-made as per your requirement. Turnstiles are the perfect way to ensure secured and welcoming entry and exit control. When the security of any office or other public place is under question, and you cannot afford to have zero public movement at that spot, then you need to be very cautious about the safety of that place. You cannot take risk of relying on a simple lock-and-key hung on a plain door or gates. Mumbai: The Railway Protection Force (RPF) and therefore the Government Railway Police (GRP) attempt to relocate the CCTV cameras put in on the premises of the Chhatrapati Shivaji Terminus (CST) as the current camera positions don’t offer adequate coverage at CST. The railways are unable to catch miscreants concerned in several incidents at CST as a result of the cameras didn’t capture clear footage of the person coming into or exiting the terminus. Out of the three hundred CCTV cameras on the premises, 168 are settled to the entry and exit points, additionally on alternative places on the premises. The work has already started and can be completed by the month-end. If permission from the government gets granted then soon Gorakhpur city will be in the JCT of CCTV cameras. The SSP has ordered to prepare a proposal to install the camera in all the intersections, major markets. The proposal will soon be sent to the government for approval. The motive is that the camera will be able to control the crime and simultaneously the city will also see the hitech. There is a big change in the development of Gorakhpur since being CM city. If the officer is preparing the proposal for the development of the city, then it is also getting government approval. In view of this, the SSP has also ordered to prepare a proposal to install cameras in the city. In an offered to improve welfare and safety efforts at real railway stations around the city, the experts on Monday chosen to introduce 130 CCTV cameras at the Secunderabad railway station and 59 at the Nampally station. Another 29 cameras will be introduced at the Kacheguda railway station. This separated, specialists have additionally chosen to put up stuff scanners close to the passages and uphold different guidelines, for model, path train inside the railway station and forcing out of vehicles discovered stopped for a drawn out stretch of time. With world business rapidly pacing to be online and more advanced by being smartphone friendly, we have apps and accounts for the most random things by the end of the day that we can’t possibly think of. With multiple social, e-commerce, net banking, business and mail accounts for both official and personal work, and each and everybody giving more preference to the fact that the user must login into an account every body today has multiple account ID’s and passwords to manage the same. And with time the requirement for these passwords soon became more and more demanding. Now the passwords had to be more than six characters and with a number and a uppercase letter. So even if you have the same passwords for all your accounts, you ought to have variations for each of the websites too! Phew! All of a sudden university exams seem to be easier to get through. The Mangrove Cell of Maharashtra Government has been facing an age old problem of encroachment across all its mangrove covered areas in Mumbai. The priority is to protect the space so as to prevent any further encroachment and tackle the long sustaining menace. Speaking to the newspapers, the Chief Conservator of Forest (CCF) Mr. N Vasudevan, who heads the State Mangrove Cell said that the department had drawn up a list of sites and routes leading to them which face constant threat by encroachers. This has been done after a detailed survey of the areas which have been recently cleared by the department. This announcement was made by the Minister of State (Health and Family Welfare) Faggan Singh Kulaste dispensed this information on Friday, in Lok Sabha. As per MCI data, till now 985 biometric devices have already been installed at 90 medical colleges. Like it or not, we all do want control of all the things that influence our lives. The reason why the global tech giants are making technology more and more integrated is so that ultimately everybody can influence there surrounding in the own personal way and as a choice that they wish to have. One such technology is home automation. Home automation is a space that has a great future, especially moving into the future. The industry is well established now but the potential is not fully explored. Home automation includes luxuries, necessities and safety to be integrated and work in tandem. In today’s article we shall read about how a comprehensive yet advanced home automation control can simplify the way we live. There are various benefits for any user through home automation. Home automation has various aspects and layers to it which add security and give complete control to a person at the touch of a finger. So much has changed and so swiftly that it’s been hard to understand. There was a time when a designer would have never envisioned that a key would not be needed to open the door anymore. The reason for this is the change in the approach of designers thanks to the integration of technology. What Should One Do If Their House Is Broken Into? What if you enter your home one fine evening after work only to notice that the house has been messed up and looted by thieves? It’s anybody’s nightmare who understands what it takes to make four walls, few door and windows a house for their family. But let’s face it things like burglary or robberies are for real and do happen. It may not happen to you but your closed ones; and when they do the victims suffering from it go under panic stress due to the loss. It can be frightening experience leaving a person shocked and vulnerable. Today we shall read about how to go ahead in such a situation. So the first thing under such a situation is that one must immediately call the police and file a FIR without touching or moving anything at all. This helps the cops in documenting the crime scene better without any evidence being hampered. How to Choose a Security Camera? The easiest and most efficient way to monitor any place in today’s world is through CCTV Surveillance Cameras. They help monitor any environment indoor or outdoor giving live updates of happenings in your building, bungalow, office, factory, public space, etc. The evolution of the camera has grown more than ten-fold in the past decade. The growth is seen from pixelated camera quality to high-definition quality. One can now view live coverage over their handheld device from anywhere in the world with internet access. In today's world security at your home and workplace is a must. In the time of the World Wide Web, finding any product is just a click away, but with so thousands of products and several companies claiming to give you the best product how does one judge which is the right product to suit his or her need? In India itself, the industry has grown several folds providing us with so many options that it is difficult to judge what is best suited for ones need. Securitykart is the website that solves that problem right there being the online portal that solves your security solutions. The eSSL iFace 102 is a multi-biometric Identification Time & Attendance as well as Access Control Terminal. The device has a fabulous black glossy finish to that makes it stand out with a futuristic design touch. The device has multi-biometric identification modes to it, making it versatile for any kind of setup and keeps it secure. It has a High-Resolution Infrared Camera which is state-of-the-art technology for face recognition devices. It’s got a face capacity of 400, Fingerprint Capacity of 2000, ID Card Capacity of 10,000 and Transaction Log Capacity of 1,00,000. This makes the device highly capable of reaching any desired requirement. The eSSL uFace 602 is a multi-biometric Identification Time & Attendance as well as Access Control Terminal. The multi-biometric device is a versatile machine that delivers promptly and efficiently at every instance. It has a face reader, fingerprint reader and optional card storage. It has various options hence delivering as per required. The device has a highly capable High-Resolution Infrared Camera which is state-of-the-art technology for face recognition devices. The eSSL is has a brilliant battery backup for times of power failure giving the user the edge in any circumstance. The device with its 1.0 GHz CPU is great at processing giving a lighting identification speed of less than 0.50 seconds. It has a 4.3”-inch TFT touch screen. It also contains a Keypad with 6 function key with 1 power button. The transaction storage capacity of 1,00,000 is also huge keeping in mind the face capacity. The eSSL iFace 302 is a multi-biometric Identification Time & Attendance as well as Access Control Terminal. The device has a contemporary design touch. The device has multi-biometric identification modes to it, making it versatile for any kind of setup and keeps it secure. It is a large capacity face recognition database storage capacity making it a valuable option for organizations looking at large capacity storage. It works on the Algorithm Version – Face 7.0. The device has a 3,000 capacity face recognition which is more than the previous 301 making this a valuable choice for large organizations. The iFace 302 trumps its predecessor by adding a Fingerprint Reader as well. The device has a highly capable High-Resolution Infrared Camera which is state-of-the-art technology for face recognition devices. It has a 4.3”-inch TFT touch screen. It also contains a Keypad with 6 function key with 1 power button. The transaction storage capacity of 1,00,000 is also huge keeping in mind the face capacity. The eSSL iFace 301 is a multi-biometric Identification Time & Attendance as well as Access Control Terminal. The device has a contemporary design touch. The device has multi-biometric identification modes to it, making it versatile for any kind of setup and keeps it secure. It is a large capacity face recognition database storage capacity making it a valuable option for organizations looking at a large capacity storage. It works on the Algorithm Version – Face 7.0. The device has a highly capable High-Resolution Infrared Camera which is state-of-the-art technology for face recognition devices. It has a 4.3”-inch TFT touch screen. It also contains a Keypad with 6 function key with 1 power button. The transaction storage capacity of 1,00,000 is also huge keeping in mind the face capacity. The eSSL VF380 is a multi-biometric Identification Time & Attendance as well as Access Control System. The device has a minimalistic design with a display and camera below it. The device has multi-biometric identification modes such as card and face recognition. It has face capacity recognition of 800 and a large card capacity of 10,000. The transaction log capacity of 1,00,000 is really good and works well for all needs for any organization. It has a compact size in a well built design which is sturdy, making it a device that is built to last. The Camera is an advanced High-Resolution Infrared Camera which is state-of-the-art technology for face recognition devices. It has a 3”-inch TFT touch screen. The eSSL KF500 is an advanced face recognition device used for time attendance and Access Control. The device is a has a full black body with a 2.8”-inch TFT Screen and a 4x4 keypad for PIN operation. The device has a face capacity of 800 and ID Card Capacity of 2,000. The device uses RS232/485, TCP/IP, USB-Host systems for communication. It is capable of handling Door Lock & Door Sensor for the Access Control Interface. The device supports Chip encryption for firmware protection as well. The eSSL VF 300 is the least intrusive and fastest biometric technology. It is hygienic and 100% touch free biometric authentication. It works with the most obvious individual identifier – the human face. Facial recognition analyzes the characteristics of a person's face images input through a digital video camera. The device is a smart device to be installed in any working environment. This gives it a professional modern look as desired by many. VF 300 is updated with simple technology and it is user friendly. It can also access ID cards, passwords. By recognition of the face of employee it generates attendance of employees and finally it will help organizations to maintain pay roll of employees. The eSSL iFace 101/102 is a multi-biometric Identification Time & Attendance as well as Access Control Terminal. The device has a fabulous black glossy finish to that makes it stand out with a futuristic design touch. The device has multi-biometric identification modes to it, making it versatile for any kind of setup and keeps it secure. It has a High-Resolution Infrared Camera which is state-of-the-art technology for face recognition devices. It’s got a face capacity of 400, Fingerprint Capacity of 2000, ID Card Capacity of 10,000 and Transaction Log Capacity of 1,00,000. This makes the device highly capable of reaching any desired requirement. Technology is constantly evolving & advancing day in and day out. The technology used in security systems has moved from PIN’s & Cards to Finger Veins & Fingerprints. The natural further step in this was the leap to Face Recognition. The face recognition system is capable of identifying or verifying a person from a digital image or a video frame from a video source. One of the ways to do this is by comparing selected facial features from the image and a face database. Why does one need any alarm systems? In India, specifically, we undermine our security systems. People believe that by simply installing a CCTV Camera or RFID Machine they have dealt with all our security problems more or less. But is that really true? Are they aware? Is the world of security be it in your home, office, shopping mall, factory, etc. only limited to the CCTV Camera’s and Time & Attendance Machines? We tend to ignore a major, important section of these security systems which in fact is the first line of defense, if one may say the intricate web of Alarm Systems. Installing alarm systems is a passive way monitoring every aspect while you are away. The eSSL Identix K20 is for Access Control in your office, school, gym, clubhouse, etc. to give you complete control over the system you govern. It is a fingerprint time & attendance system. It can read fingerprint templates and has card reading capacity as well. It comes in a two tone design which is very modern and impressive. The unit also packs in a 2.8”-inch TFT Screen and a 500 DPI Optical Sensor for fingerprint scanning. This along with the very quick response rate makes it an ideal device for small organizations. The eSSL Identix SF100 has redefined the term miniature with its design and sheer size. For the given size, the machine does wonders in the world of biometric identification devices. It gives the user big value in a small package. It has been designed for those who want to put a compact device to administer their workplace efficiently. The machine is devised to recognize 500 fingerprint templates and has a capacity to read 5,000 cards. It has a long list of features to floor you, a 2.8”-inch Color TFT display, Door Sensors, Alarm, Door Bell are a few. The eSSL Identix MB200 is a multi-bio time attendance system with fingerprint& face reading capacity. The device is a well designed compact piece in a black finish with a 2.8”- inch TFT Screen. The device boasts a finger recognition system with a response time of less than 0.50 seconds. With multi recognition system, real time attendance and a contemporary design this should be your choice for access control and time attendance management. The eSSL Identix K21 gives you the complete package for Fingerprint Time & Attendance System. It comes with a 2.8”-inch Color TFT Screen. It features a fingerprint sensor with 500 DPI Optical Sensor. This system gives you a dual mode of Access Control – either SSR Mode or Software Mode. This feature makes it more advanced than its predecessor the K20. It has a SSR Recorder and Automatic Status Switch along with Self Service Query. The device has a quick response rate of less than 1 second. The eSSL Identix KF200 is a beautiful black Face Time Attendance device for those who are conscious about the look and feel. The eSSL KF200 is a slender with a face capacity of 400. A supportive 32-bit microprocessor is fit into the device which also makes it SDK & Software compatible. It has features such as work code, SMS, DST, T9 input, Photo ID, Camera, etc. The communication is swift via TCP/IP and an alternative USB-host. The KF200 is a face time attendance system designed to produce results. The eSSL Identix Excel is a value for money device that supports all basic necessities for a small organization. 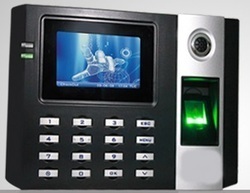 The fingerprint time & attendance machine with access control system. It has a compact design with a black finish and numeric keypad. It also has a 2.8-inch TFT Screen and dual LED’s in Green & Red. It comes with an optional built-in battery for the user’s requirement. The finger reader/sensor is capable of storing 500 templates and having a card capacity of 500 as well. The fingerprint recognition system is equipped with a 500DPI Optical Sensor which gives identification speeds of less than equal to 1 second. The device’s has a transaction storage capacity of 50,000. The device also has a SSR Recorder, making it dual mode – SSR Mode or Software Mode. Major Applications such as Time & Attendance, School Attendance, Canteen Management and Production Management run smoothly. Identix Excel time and attendance system is customized and well designed for its users. Technology and digitalization have seen a considerable growth so improve your way of managing things at education and corporate levels by purchasing this essl identix Excel. Major Applications : Time & Attendance,Canteen management,School attedance,Production Management,Gym & clubs. The eSSL Identix K30 is a fingerprint time & attendance machine with access control system. It has a modern build with a matte black finish and 2.8-inch TFT Screen. It comes with an built-in battery for the user’s requirement. The finger reader is capable of storing 1,000 templates and having a card capacity of 1,000 as well. The fingerprint recognition system is equipped with a 500DPI Optical Sensor which gives identification speeds of less than equal to 1 second. eSSL FF1000 is a Time and Attendance with Access Control system to be associated with the latest face recognition and RFID functions, It is build with the newely core board and firmware. The eSSL Identix FF1000 is a biometric time attendance & access control which delivers gives the user a real time attendance for employees. The device has primary with RFID Card reader for recognition. It’s got a 2.8-inch TFT Screen which supports Photo ID. The eSSL Identix K13 is a unique offering from the company in its Identix Series, offering a unique blend of design and sensibility. The device comes with a fingerprint reader software which can read up to 1,000 fingerprints & have a transaction memory of up to 80,000. It is also enabled with a card reader having a capacity of 1,000 cards. The device has a 2.8”-inch Color TFT screen accompanied by a 4x4 keypad layout below. To the right of the screen it has a fingerprint scanner. The engine in the K13 is powered by a 32-bit microprocessor. It’s got a 500 DPI Optical Sensor. On November 8th 2016, the country was addressed by our Honorable Prime Minister Shri Narendra Modi on the Government’s next big step towards tackling the black money menace. With the note ban in effect within hours of this major announcement, people slammed the panic button just too hard. They started searching for alternate ways to dispose of the money they have in exchange of anything else. There were buyers, hence the sellers made most of the opportunity. One such industry was the jewellery & diamond industry. From small to big shops, all had an inflow of customers with hard cash demanding for gold and other valuables at any cost. The price for gold in such a market shot up to as high as even Rs. 60,000 reportedly. Mr. & Mrs. Shelar had recently bought a sprawling 3BHK apartment in a posh suburban locality of Mumbai. They along with their two daughters and Mr. Shelar mother have moved in last month. They did up the interiors with great panache, from the marble flooring to teak wood furniture and even a crystal chandelier. But in the second month that they moved in it, there was a robbery at their place during the night. Some money and electronics was stolen from under their nose in the wee hours of night. The culprit wasn’t caught but they still couldn’t figure out how could it be? They made sure to have a safety door with a lock and grill outside every window and still couldn’t believe this happened to them! ZKTeco SF100 Fingerprint time and attendance biometric access control systems. The SF100 is an IP based fingerprint terminal works both in network and standalone modes. In network mode, it can connect with ZKAccess3.5 software for access control and time attendance management. Wiegand output makes SF100 flexible to connect with ZK or any 3rd party controllers as a slave reader. Additionally wiegand input allows two units of SF100 to configure with each other and utilize Master & Slave solution, which requires user verification at both entrance and exit. Meanwhile, anti-pass back function can be used to maximize the security. Auxiliary input interface allows SF100 to connect with an external source, for instance, a smoke detector or emergency switch. Once the linkage function is enabled through the machine menu, the device would generate an alarm signal and open the door in case of emergency. ZKTeco SC405 fingerprint time and attendance biometric access control systems. SC405 is a RFID Access Control Terminal which possesses a 2.0-inch color display with graphical UI, enabling simple and easy control. It has a built- in auxiliary input function which enhances the flexibility to be connected with wired detector or emergency switch. With multi-verification methods by combinations of PIN, password and card, high level of security and flexibility are guaranteed. Moreover, the product supports USB flash drive for offline data management, as well as is equipped with multiple alarm outputs such as Tamper Proof Switch and Duress Alarm. Its convenience and adaptability allow it to be well deployed in residential housing, offices and any other public facilities. The device software offers multiple language support which makes it highly versatile as well. ZKTeco ICLOCK-700 Fingerprint time and attendance access control biometric system with different internationalized elements. iClock700 is a 3.5-inch TFT Screen Time & Attendance and Access Control Terminal. With the new user-friendly firmware, iClock700 is equipped with features like stunning GUI, more stability, faster matching speed and better expandability. iClock700 is compatible with various types of USB flash disks, ADMS and former SDK. Moreover, RS232/485, TCP/IP, and USB client ensures a smooth date transmission between device and PC. It also has optional features like GPRS, Wi-Fi and 3G connectivity and access control connectivity with Wiegand out and in, electric lock, door sensor, exit button, alarm and door bell. ZKTeco FR1300 Fingerprint Time and Attendance biometric systems with built-in RFID and with doorbell function. FR1300 is an indoor slave reader with RS485 interface that works with master controllers from ZKTeco, for example, in BIO series biometric control panels. As a value-added slave reader, FR1300 provides the most secure and cost effective access control solution for small and medium enterprises. The ZKTeco TF1700 is one of the world’s smallest Ethernet connection-based fingerprint terminals, used for access control and time attendance IP65 waterproof housing. With its IP65 rated rugged waterproof and dustproof structure, TF1700 offers extra durability in harsh conditions such as outdoor environments. It is specially designed for standalone applications such as house, office, shop, garage, factory and others. The 2013 version of TF1700 is equipped with a sensor cover to protect the optical reader and updated with new firmware that supports ZKAccess3.5 management software which has versatile features and powerful functions. ZKTecho SilkBio-100TC fingerprint multi biometric time and attendance systems with quick recognition of fingers. SilkBio-100TC is the first ever Time & Attendance and Access Control Terminal to be associated with SilkID fingerprint reader, face recognition and FRID card functions. With the new SilkID fingerprint reader, the operation remains stable under strong light source and high preciseness of verification of wet and rough fingers. With latest facial algorithm and the innovation features, Silkbio-100TC is bringing you the whole new experience. Realtime ST10 time and attendance fingerprint biometric attendance systems. The Realtime – ST 10 looks like a simple black device, but don’t let the compact size deceive you of the real features it possess. It has a fingerprint & card slave reader. It has Multiple Verification Modes including Fingerprint, Card & Password. The scanner boasts of an identification speed of less than 1sec. It supports all the functions working with a Master Device hence not containing any limit directly to the input of its memory. Realtime T501F fingerprint time and attendance biometric access control systems. The Realtime T501F comes with an enhanced storage of 5,000 Face Registrations for recognition. The brilliance of the device is highlighted with its large identification capacities and user records. It has a maximum attendance log of 300,000. The 4.3-inch touch screen LCD makes the user experience smooth and effective due to its vibrant and large display placed on a handsome black panel with a fingerprint sensor to its right. The device also comes embedded with two high definition cameras for more efficiency. The identification speed is upto 1 second and the T501F delivers a 3 hour battery backup and sleep mode make it a highly competent device in terms experience and efficiency. Realtime T12N fingerprint time and attendance access control biometric systems. The Realtime T-12N Access the smallest fingerprint Professional Access Control System. As defined has a compact build, which is finished in brushed metal aluminum finish. The front has a PIN Keyboard and a blue monochrome LED screen. The device also works as a master device to support other Realtime devices such as the Realtime – ST 10N. The unit also supports EM Lock to connect. The device has a USB link & TCP/IP connectivity giving it use as well as flexibility. It also supports multiple languages. The Realtime T-12N Access gives you immense flexibility with multiple connectivity, multi-language input and various modes to chose from – Stand Alone Mode / Master Mode/ Reader Mode. Realtime T13 fingerprint time and attendance biometric systems. The Realtime T-13 is a state-of-the-art fingerprint access control & time attendance machine. It has a modern 2.8-inch TFT Color Display with vibrant colors and a display resolution of 320 x 240 pixels. The device is fitted with an Optical Sensor for reading Fingerprints. The reader has a multiple identification modes – Fingerprint, RFID Card, and Password as well as a combination of Password + Fingerprint or Card + Fingerprint. The Realtime T-13 can read upto 2,000 fingerprints or cards. It allows contact-less card reading experience making it more efficient every time you use it. The Realtime T-13 is great for large offices and organizations. Realtime T123 fingerprint time and attendance access control biometric systems. The Realtime T-123 is a basic standalone access control system. It has a built-in Proximity Card Sensor & PIN Keyboard. The device is capable of reading cards even beyond 5 centimeters. This enables a smooth way of Access Control with the EM card. The device also has a backlit keypad which makes it highly-legible even in inadequately lit spaces. The Realtime T-123 has a memory to sustain 6399 Card or password reading. Realtime TD-1D Fingerprint Time and Attendance access control biometric systems with optical sensor. The Realtime TD1D is a small and compact device which provides access control via Fingerprint Scanning & RFID Card Reader. The Optical Fingerprint Module is highly resourceful, assisted with the with the 500DPI Resolution. It has a compact size and is light weight making it pleasing to view. Installing this access control device gives you complete attendance and authorization. It’s a small package with big benefits. Realtime T61 time and attendance access control biometric systems. If you were thinking of a sleek Professional Access Control device which offers Bell & Cloud connectivity for your office or enterprise, look no further than the Realtime T61. It’s a slim and tall machine compact enough to snuggle into most spaces. The 2.8-inch color display is a gem to view with the neatly layed out keypad and snappy fingerprint sensor below. The Realtime T61 provides seamless integration of the ST20 and EM Lock to connect. It is the master device for the ST-20. Realtime T7 Fingerprint Time and Attendance biometric access control systems. The Realtime T7 Access is an elegant white body design with a premium finish for all those who wish to have a niche device equipped in their premises. The device offers online & offline identification mode. The 2.4-inch TFT Color Screen offers a great visual experience. The T7 Access has a swift identification time of less than 0.80 seconds. In the event of the log capacity being maxed out it even has an Alarm for the indication of the same. Realtime T71F Fingerprint Time and Attendance access control biometric systems with Image sensor and Duplicate Enrollment protection. The Realtime T-71F is a device which is set out to cater small to medium enterprises with Max Users of 300-700 for Face Templates. The Face ID Attendance Recorder & Access Control System has a Fingerprint, Password & RFID Card identification as well along with the Face ID. The T71F has a 2.8-inch TFT Color Screen along with a 320x240 pixel display. The huge log capacity of 200,000 is sufficient for most. The company also provides an addition External Battery Backup if required. The device is lightweight and uncomplicated making it a breeze to use. Realtime T500F fingerprint time and attendance biometric access control system. The Realtime T500F is a very capable access control device which can store upto 3000 Face Registrations for recognition. The brilliance of the device is highlighted with its large identification capacities and user records. The Realtime T500F also has a Touch Screen making it very futuristic in not just appearance but function as well. The device is also fitted with two high definition cameras for greater efficiency. If face recognition is the way you wish to authorize control in your organization, then you have a stunning device embedded with great technology. Realtime T302F fingerprint time and attendance access control biometric locks. The Realtime T302F is an access control device from the Realtime range which has support for Face Recognition. The T302F takes things to another level with its list of features. The device is has a clean UI supporting Face, Fingerprint, Card, Password & Combinations to identify. The device has a voice interface and battery backup of upto 3 Hours which makes it highly effective in cases of power failures. The Fingerprint input angle is also 360° making the interactivity more and efficient. This product from Realtime is also equipped with Wi-Fi as optional making connectivity a breeze. The Door Sensor & Exit Button sensor input is also supported while assigning Door Control is a breeze. A long list of specifications & features makes the product a must for every office & organization. The Realtime - ST 20 is a fingerprint & card slave reader which works with the Master Machine. The device also comes with a numerical keypad and Dual LED like the Realtime ST 10 & Realtime ST 10N. It supports all the functions working with a Master Device hence not containing any limit directly to the input of its memory. The device comes with Voice Assist and Dual LED. The eSSL V350 comes with fast multi-biometric verification. It has stable operation under a strong light source. The device also supports fake face detection. The real highlight of the eSSL V350 is the battery backup of 2000mAh which will be utilized to power the device in case of a power failure. Hence this allows complete authorization to control access in any enterprise. The eSSL ProCapture-T is delivers special functions such as Multiple Verification Modes, Alive Finger Detection, Event Snapshot & an optional User Photo. eSSL SilkBio-100TC fingerprint multi biometric time and attendance systems with quick recognition of fingers. The eSSL SilkBio-100TC comes with fast multi-biometric verification. It has stable operation under a strong light source. The device also supports fake face detection. The real highlight of the eSSL SilkBio-100TC is the battery backup of 2000mAh which will be utilized to power the device in case of a power failure. Hence this allows complete authorization to control access in any enterprise. The eSSL ProCapture-T is delivers special functions such as Multiple Verification Modes, Alive Finger Detection, Event Snapshot & an optional User Photo. The eSSL Multibio 800-H is a fingerprint scanning enabled Access Control and Time Attendance System. It comes with multi door controllers via weigand & SDK for desktop applications. The Multibio 800-H contains a 500 DPI Optical Sensor. It contains a Green/Red LED indicator as well as mini-speaker. The smart office suite & elite track lite are compatible with the desktop & web support. The eSSL Multibio 800-H supports external printer as well. TF1600 Fingerprint Time and Attendance biometric access control system with optical sensors. The eSSL T1600 is a power packed With its IP65 rated rugged waterproof and dustproof structure device can be used out door, it is a piece from the reputed company having a Standalone Fingerprint Time Attendance & Access Control System. The slim and sleek design packs features such as 3,000 Fingerprint Templates & 30,000 Card Storages. The 500DPI Optical Sensor provides great support to give an identification speed of less than 0.5 seconds. There is a 12V Relay for Lock. The device is compatible with Multi Door controllers via weigand. A smart office suite & Etime track lite for desktop software’s give optimum results. Be it attendance or management, the device is always ready to deliver optimum performance. eSSL PROCAPTURE-T fingerprint sensor time and attendance biometric access control system. The eSSL ProCapture-T is a Fingerprint Access Control System with a modern design to suit your contemporary office interiors. The sleek black look can gel with any design. The eSSL ProCapture-T is delivers special functions such as Multiple Verification Modes, Alive Finger Detection, Event Snapshot & an optional User Photo. The device comes with the revolutionary SilkID Fingerprint Sensor. The SilkID Fingerprint Sensor delivers outstanding performance with Dry, Wet & Rough Fingers. The advanced Fingerprint Algorithm Finger v10.0 assists in delivering flawless recognition. eSSL Pro Bio fingerprint sensor time and attendance biometric access control system. The eSSL ProBio is equipped with the revolutionary SilkID Fingerprint Sensor. The SilkID Fingerprint Sensor delivers outstanding performance with Dry, Wet & Rough Fingers. The device comes with four verification modes including Face, Fingerprint, Card and Password. It has a built-in camera for face recognition. The eSSL ProBio can store upto 4,000 fingerprints & has a card capacity of 10,000 cards. In addition, it has a face recognition capacity of upto 4,000. It has a modern 2.8-inch TFT LCD color touch screen installed with a 1.2GHz Dual Core CPU for the processing making it a powerful device. eSSL INPULSE fingerprint time and attendance biometric access control system. The eSSL inPulse is a high security finger vein recognition system with an interactive user Interface. It supports 3 verification modes – finger vein, card and password. It has a modern 2.8-inch TFT LCD color touch screen installed to operate the user smooth interface. Realtime T600 is an innovative biometric card reader. Realtime T600 used in various biometric systems like access control system etc. The Realtime T600 is a compact device capable of reading EM Cards for attendance and access control generating logs of upto 100,000. The device has Door Relay terminals, bell terminals, door sensor input, etc. The Realtime T600 gives you immense flexibility with multiple connectivity, multi-language input and various modes to chose from – Stand Alone Mode / Master Mode/ Reader Mode. In today’s world, authorization of a person into any space, physical or informative, has become a mandate in order to remove unwanted elements from breaching into your organization. The practice of restricting entrance into any property, building or room to authorized persons is known as Access Control. Securitykart is the authorized distributor and dealer in Mumbai for security products like CCTV Cameras, Time and Attendance systems, Access control, Digital safes, Digital Video Recorders, Door Locks, Video Door Phones, Alarm Systems, Home Security and Surveillance systems. Securitykart is into this vertical of business since 2005 and are successful, securitykart has now launched an store for end customers to buy security products online as much quantity as they want. The final section of Maharashtra Government’s determined Mumbai City police work Project (MCSP), comprising a half dozen (6000) CCTV cameras, is complete and can be launched in the month of October 2. As of now, around 2,000 of those 6000 CCTV area units are operating, a home department official told PTI. Larsen and Toubro (L&T) bagged the Rs 959 Cr contract of the State government for securing Mumbai with the CCTV Surveillance Camera. In Dec, Chief Minister Mr. Devendra Fadanvis inaugurated the primary section of this project with around, 1,381 CCTV’s installations at 434 locations in south Mumbai. A new entry on the block, is that the Home Security Alarm Systems. They offers a glimpse into what is probably to be the norm in home automation and security in a very few years. The system starts with a Godrej Eagle I Smart Plug and Play alarm systems, that simply has to be plugged within the socket and your premises is secured. Technology touches nearly each side of our lives. Several of the items we have a tendency to do daily and consider granted are due to advances in computer-based technology. Yet today, nearly all homes still don't have anything over a bolt lock and door handle keeping them safe. Most people still use a key to unlock our doors, a similar as did our grandparents. When the majority considers home security, their attention sometimes focuses on detective work or deterring unwanted intruders, however, because of advances in technology, home security systems can give much more than police work and property protection. Rapid technological development implies that these day's home security systems usually feature a variety of safety and style sweetening functions that enable house owners to remotely management lighting and air-conditioning. Nashik: The city police has settled an expert to embrace the nearby circuit TV (CCTV) venture over the city. A year ago, a proposition was sent by a police commissioner ate communicating prerequisite of CCTVs in Nashik, taking after which, the state government gave a gesture to the IT division to check the extent of work for introducing the cameras. Property; your own/rented or residential, commercial or industrial needs protection from any sort of unauthorized entry. Wireless Burglar alarm systems as designed specifically to detect intruders, and can be placed in specific areas of your choice. Wireless burglar alarm systems have another plus point whereby users can place them in desired locations, without having to bother about it’s wiring. In country like India, several professionals are displaced from their hometowns and homes owing to availability of jobs. Professionals today prefer living as tenants even though they could be homeowners in their preferred town or location. Surat Municipal Corporation (SMC) will soon be welcoming tenders for introducing 1,000 CCTV cameras over the city. The nitty gritty venture report (DPR) by Bharat Heavy Electronics Limited (BHEL) as a piece of Smart City activity additionally imagines an Integrated Transport and Mobility Administration Center (ITMAC) for better coordination between various organizations. SMC has selected PricewaterhouseCoopers (PWC) as specialized advisors for the undertaking. Tata Consulting Engineers would get ready structural arrangement for the ITMAC building. "All crisis and utility administrations including flame, rescue vehicle and transport would be conveyed to one building so that there is better coordination between them," civil magistrate Milind Torwane said. The District Administration has guided banks to introduce CCTV Surveillance cameras on vehicles conveying money. While holding a meeting with the bank authorities at the Mini-Secretariat, Additional Deputy Commissioner Mr. Parminder Pal Singh Sandhu said the money related establishments ought to bring into utilizing the most recent innovation, which could demonstrate as an obstruction against crime. It will soon be compulsory for open transport transports to introduce panic button, CCTV cameras and vehicle GPS beacons guarantee the security of ladies workers, Road Transport and Highways Minister Mr. Nitin Gadkari said. He included that the administration will issue a warning on June 2, setting out the wellbeing measures to be introduced in broad daylight public transports the nation over. Gadkari said, "To guarantee security of the ladies after the disastrous Nirbhaya episode, we have chosen to make it compulsory for open public transports to introduce panic button, CCTV cameras and GPS-empowered vehicle GPS tracker." Are Delhi Surveillance Cameras Just for Showpiece? The Delhi Police has introduced more than four thousand CCTV cameras over the city to secure the regular man in the event of any outcome like terrorist assaults, however very few of them work. Are Delhi showcases truly sheltered? Are the CCTV cameras introduced by Delhi police truly working, or have they been transformed into negligible show pieces? The Delhi Police has at long last conceded that three out of these four cameras are not in working condition. In 2013 alone the surveillance security systems and equipment market in India earned a revenue of $300 million. These figures were in accordance to the reports published by the IHS Inc. (NYSE: IHS) that was titled as “The Market for CCTV and Video Surveillance Equipment.” Their forecast for the next 5 years showcases only growth, which is a good sign! After the new Government of India was elected in 2014, there has been an emphasis on security systems and the need for it as a nation. Smart city plans, traffic surveillance, education institutions and railways are some areas where video surveillance is a few public projects that the Government is looking to reform. Plans in these sectors have already been announced. Ever wondered what is happening at home especially when you are not there? Do you think that while you are away slogging at work, your teenage kids are planning on throwing a party? Wondering if your kids who come home from school while you are at work are safe, doing their homework and resting? These are life’s little worries that you just cannot solve, unless you are equipped with the boon technology has in store for you. The biggest benefit of having a home equipped with an IP Video door phone is that you know what is going on in your home even when you are not there. MUMBAI: The state authority on Monday told the Bombay high court that they will introduce CCTV cameras at 25 police headquarters on a pilot premise before the end of the month. The administration amended its before responsibility of introducing CCTV surveillance camera by March before the HC that is listening to petitions looking for activity in two custodial demise cases. The court has advised the legislature to clear up its stand on techniques and law, representing instances of death of charge in care. NEW DELHI: Shan-e-Punjab Express turned into nation's first train to have CCTV cameras introduced in all coaches, as a major aspect of Railways' endeavors to reinforce security of travelers especially ladies voyagers travelers. "We have guaranteed it in the budget and today we have satisfied our guarantee," Railway Minister Suresh Prabhu said subsequent to hailing off the CCTV-prepared train from Amritsar through video-conferencing in the national capital. Launched globally in September 2014, the 'Make in India' initiative is poised at giving manufacturing sectors a huge push. The initiative has not only given local manufactures a platform to make its impact worldwide, but aims at attracting foreign investors. On the same track the 'Make in India' week long soiree was held in Mumbai. The idea was to showcase the immense strength of local industries and business as well as set the stage for foreign investment. The event was a huge success with investment commitments to over a tune of Rs. 15.2 crore made. The event was a platform that showcased not just innovative manufacturing processes but even technology in the security industry. Introducing CCTV cameras at Race Course Road to check the normal guilty parties of flighty junk dumping appears to have paid results for the volunteers of Voice of Amritsar. The NGO had effectively driven the battle to clean and introduce CCTV Cameras at different empty plots out and about that had been transformed into the dumps. Checking the customary guilty parties and getting them on video, the volunteers have distinguished a few violators, including clean workers,who had been dumping the aggregate waste on the empty plot. Mr. Arpit Shukla, The Police Commissioner of Jalandhar, today dispatched a project "Ankhein" in which CCTV cameras would be introduced in the different delicate regions in the city to keep tab over hostile to social components. The venture was propelled amid a police-openly meet with the police official, where a few individuals took take part. Mr. Shukla said under this venture, the police would direct a study in the city to spot delicate zones. After the charged assault of a nine-year-old girl in a Dadar school recently, the state government wants to introduce CCTV cameras on school premises in an offer to secure the students. Maharashtra State Legislative Council administrator Ramraje Nimbalkar said this is a major issue and the administration needs to handle it successfully by putting propelled observation innovation. He included that the legislature might not have the finances for the establishment of CCTVs, but rather it can take from the MP, MLA reserve. "The administration can likewise utilize the Corporate Service Responsibility store," administrator said. Vasco: Most of the 52 CCTV cameras that are noticeable on electric shafts at critical intersections in Vasco (Goa) are ancient, which is a set-back to Vasco police as well as for the criminal investigation. This is because of the disappointment of the powers to sign a yearly support contract (AMC) with an adequate term and strict conditions. As per Mormugao Municipal Council executive Deepak Naik, the 52 CCTV cameras were introduced under the MPLAD plan to anticipate undesirable exercises and to keep a nearby watch on suspicious exercises. The cameras were likewise expected to help the civil assessors keep a check on invasions by sellers. Be that as it may, these cameras have been old for over a year. Pune: A robber carried off Rs 1.24 lakh money from the Sadhana English Medium School at Gadital in Hadapsar on Sunday. The robbery became exposed around 9am on Sunday. The school representative Yogesh Zende (35) from Malwadi has registered a complaint with the police. The stolen money was the expenses gathered from the students. Inspector (Crime) Anjum Bagwan of the Hadapsar police headquarters said the thief broke the locks of the primary entryway, parcel and office way to pick up section into the workplace. Two days following a 35-year-old manufacturer was shot dead outside his home in north Delhi's Ballimaran region, police have recognized the three attackers with the assistance of footage from CCTV cameras. Police associate the inclusion with the nearby developer mafia, however, are examining all edges, including a blackmail offer. Police have retrieved CCTV footage from the path where the casualty, Faheem Ahmed, was sitting alongside neighborhood occupants. The footage indicates three men pursuing without end shooting Ahmed. Be that as it may, the victim’s family members could not identify any of the attackers. VISAKHAPATNAM: As numerous as 47 movement signal focuses on, the city will be updated with CCTV cameras inside next two weeks. Commissioner of Police Mr.Amit Garg said. Initiating the Airlova Traffic Police Station at Hanumanthawaka Junction zone here yesterday, the city police boss said as a piece of fresh policing and security activity arrangement of Vizag, 128 Surveillance CCTV cameras has been introduced at 47 intersections. The establishment has been finished by Hyderabad-construct a private firm Stan Power in light of BOT premise and would set up another 130 CCTV cameras in the following stages at the 47 intersections to bring the city under the observation radar. CHENNAI: Women inhabitants of Tondiarpet had been disconcerted: Many of their undergarments have been lost from the balcony. A high court legal advisor who lives in the territory at long last comprehended the riddle on Monday when he gave over CCTV footage demonstrating a so called Godman in the area lifting undergarments from clotheslines. Vijayakumar, 57, the saffron-clad man who roamed the roadways during the evening, is presently in jail. An examination officer said Vijayakumar had a mental issue. "On an addressing, he let us know that he got a kick out of taking the underpants and wearing them," an official said. He admitted to police that he had been taking from the region for a year. The XV metropolitan judge court in George Town sent him to prison. Every Man wants His Family in a Safer Place;Why not go for CCTV Systems? Were you caught up in a conversation about safety of your loved one's? . Rising crime rate gives you nightmares about the safety?. We your with a crazy idea of building your house at a safer place?. We'll.... Most of the men out there are really concerned about their family's safety. Not present physically gave them nightmares especially in places the crime rates are on rise. Some move out from place to place to make sure things around their loved one's are safe. Is the idea really welcome? who can guarantee about the place being safer?. Central government have made it mandatory to install cctv cameras at all the schools and colleges throughout India. Police departments across all states have requested the schools and colleges to implement as soon as possible to prevent eve-teasing and child molestation. The department says, "We have done our best to prevent such incidents which happens especially around schools and colleges". Increase in such incidents with no evidences have left us stranded. In recent years fingerprint recognition technology has made huge strides. Even before fingerprint scanners came into existence, fingerprints played a major role in forensic science. Since every fingerprint is unique, identifying criminals was an easy process, provided it matched with their criminal list of fingerprint database. This similar technology has now further moved forward and is rampantly being used as a fingerprint recognition device which is a biometric device. Fingerprint recognition devices work on some simple principles; firstly storing information of a person’s finger e.g. ridges, loops, branches on a finger. Secondly comparing the persons fingerprint with the already stored scanned image. With regards to your family's security, always believe your gut. But at the same time it's critical to put forth some intense inquiries and debate for the sake of debating. For instance, one basically a critical question to ask yourself is the place do you (and your relatives) think you require security cameras? Another is to figure out what are the most helpless spots on your property? Still more things to ask are do you have covered up or darkened doorways, windows or entryways that would be especially speaking to thieves? Have you or past proprietors experienced break-ins, some time recently? Assuming this is the case, where? Supreme court on Tuesday calls Maharashtra government's move on CCTV cameras mandatory at dance bars as "absurd". SC also stated that, It not only takes away one's privacy but, violates the fundamental rights of the bar owner s in carrying out their business. When asked about the state government's move the bar owners stated saying, "Who would want to be photographed or videographed while they are drinking?". It also embarrasses the customers and there are risks of losing customers eventual leading to loss of business! The justice bench comprising Dipak Misra and Justice Shiva Kirti Singh also told Pinky Anand(Socialite who filed the case against dance bars ) the government cannot interfere i n privacy of any Indian citizen or business but only regulate. The justice bench also asked Anand to not look at dance as vulgarity rather, look at it as an art by eliminating the obscenity. In a conclusive statement, the bench said: "Women who are work at these dance bars term it as profession. Every Women infact every Indian citizen has their right for profession.Their right should be respected and possible that this is also source of livelihood for transgenders". Presenting Railway Budget of 2016-17 in Parliament today, the Minister of Railways Shri Suresh Prabhakar Prabhu said that the redevelopment of stations utilizing distinctive models is being tested. In light of one of these models, budgetary offer has been gotten for redevelopment of Habibganj station in Bhopal, while 4 different stations are in cutting edge phase of offering. In a historic discussion, Cabinet has endorsed redevelopment of 400 stations through PPP (Public Private Partnership). This relies upon to be the biggest travel arranged advancement of the planet and, subsequently, includes complex choice making. Ahemedabad, Gujarat Police enlisted an unconditional apology to the Gujarat high court for neglecting to finish establishment of CCTV cameras at all police headquarters over the state, according to the court the request went in November 2012. In additional DGP V K Mall guaranteed the court that he would be careful later on that the undertaking of introducing cameras would be finished at the given time. He submitted in the witness of the court that the establishment of CCTVs in each of the 610 police headquarters in Gujarat would be finished by March-end. District magistrate adds shame to swatch bharath act! UPSRTC (Uttar Pradesh State Transport Corporation) has chosen to post pictures and recordings of individuals who are discovered peeing out in the open on a YouTube channel, with a specific end goal to teach them a lesson. This is most likely one of the most ideal approaches to handle the issue of individuals who take a break all alone will in broad daylight spaces. Particularly in spots such as bus stops, the UPSRTC has chosen to introduce CCTV cameras, and later post the photos and recordings to turn those got in the demonstration, into a fool on the web! The UPSRTC has positively nailed the best approach.The arrangement was started by the Swacch Bharat office, with the intend to spread alertness about the health dangers of urinating in the open. Prabhakar Mishra, Regional director, UPSRTC, said, Our aim is to change the nature of the people who avoid open toilets and pee in the open. All things considered, it is for the advancement of all. On the heels of this declaration comes another disgraceful act by OP Shrivastavaan, Additional District Magistrate (ADM) from Allahabad, who was discovered relieving himself in the blessed Ganga-Yamuna-Saraswati Triveni Sangam in Allahabad. OP Shrivastava was going to the area for a public interview on the 'Triveni Mahotsav'. According to the reports, the ADM utilized the reason that he was diabetic and had no other decision yet to take care of nature's call. Maybe, he must be the first to enter the UPSRTC's YouTube lobby of shame. A test has been requested after the photographs of the ADM got at the demonstration circulated around the web on online networking. The Delhi High Court on Wednesday drag the Delhi police for its inability to introduce CCTV cameras at all police headquarters in the national capital, regardless of having taken the activity 13 years back. The court additionally termed the police's reaction in the matter as "a complete eyewash" and said the power did not know whether the cameras that are installed so far we're working. In so far as CCTV cameras are concerned, the time taken by the Delhi police is not empowering. They have introduced CCTV cameras at 108 police headquarters out of 190 in 2002-2004. That was 13 years back. This is unexpected that after expiry of 13 years, the Delhi police needs to do a pilot project (PP) without any delay ,Mr. Ahmed and Mr. Sachdeva ,said. One of the hardest stress taken by people is who will take care of the loved ones (parents, friends and family) while we are away. Many of them faces this difficulty of how this all is going to happen. Let's have a glance how CCTV is helpful. Helps in monitoring residential premises – There been a lot of theft & robbery cases been recorded within this year. This is not just the end there are many high-FY residential areas Where people are not concerned about security and hence end up with some uncertainty. Mainly in India govt and police department themselves are requesting cooperative housing societies to adopt a surveillance system in their premises so that it is safe for them as well for the police department. Because if in case some robbery happens and it’s been recorded it will be more than easy for the police to solve the robbery case. Deputy Commisioner (DC) Rai Mahimapat Rai on Saturday asked Bokaro Steel Plant (BSL) management to provide CCTV cameras for the section police to enhance safety measures of the residents. DC in the action to resolve the growing issues in a meeting with administrators of BSL at his office. The actual DC together with SP B Ohydrates Ramesh interacted with the managing director, GMs and also DGMs involving BSL. Home - the place where you live with our loved ones, family and friends, where we grew up, a place where tons of memories are shared. After a bad day at school/colleges, hectic day at office, a place we can go and relax and forget all the things we have gone throughout the day and just says "It feels good to be home". Precautions that can be taken to protect the loved ones. There are many ways to protect your house - one of the way is to secure the house by installing CCTV Cameras. CCTV i.e. Closed Circuit Television is also known as video surveillance which are helpful for monitoring the activity that are happening around the premises when you are away. CCTV can operate continuously or only at a particular event. There are different types of CCTV cameras with different brands available in the market which are helpful as per need. For a small leaving place, we can install a small dome CCTV camera inside the house or a bullet CCTV outside the house premises as they are weatherproof camera with high definition and can monitor the event happening outside/inside while you are away, according to the need features can be filtered out. When you have a kid at home and in some circumstances you have to go away and the caretaker watching the kid, but you still want to see what is happening and how the kid is, you can install IP (Internet Protocol) cameras which carries the features of sending and receiving data via a computer network and the internet, activity happening inside the house can be monitored with the help of internet. Other than installing a CCTV camera we can place VDP (Video Door Phones), it's an intercom system which is used to manage calls that are made at the entrance of a building, residential family, workplace, etc. with audio and video communication between inside and outside. Video Door Phones enable the person indoors to identify the visitors. If they wish, they do the conversation through the phone or let the visitor come in. Protect your home by taking precautions for your loved ones. Aadhar based biometric time & attendance systems manditory for Government offices in Jammu and Kashmir by March 31 this year.This was revealed during the initial meeting of the State Administrative Council led by the Governor Mr. NN Vohra. A Raj Bhavan representative said "It was decided that all the administration workplaces should have Aadhaar based Biometric Time & Attendance System in position by March 31, this year." A man is seen on CCTV footage roaming calmly into the ICU of a private doctor's facility in Haryana's Bahadurgarh, where he assaulted the mother who gave birth to a baby. He told the gatekeeper that he was a specialist and entered the ward around 3:30 am. He is seen continuously on his mobile while entering the ICU. After entering the ward he is seen checking out the patient. The accused made a similar attempt in the neighboring hospital, but the women woke up and raised the alarm. Police has ceased the CCTV footage of both the hospital and launched an investigation. A red Santro, hustling through a restricted path,plunges two walkers onto the street side. It continues onward, two men tossed into its hat. A few moments later, they are swayed into the air and fall onto the ground. These depress deep elements captured by the security camera at a condo in Chennai. The driver, who works at a bank situated in the building, was recognized as Venkatesh and captured. Two of the five individuals he hit died the next day declared dead at a private clinic.The casualties were remaining out and about and talking, when the car slammed into them. He was not drunk, Venkatesh is an accomplished driver," said senior police Mr. Jawahar. Police sources say the driver was speeding, hit a wall and lost control and instead of applying brakes Venkatesh slammed into accelerator as he approached the men. CCTV footage of Communist party of India (Marxists) leader robbing an NRI based business man's house in North Kerala of Kasargode district. According to police reports, the suspect (Raghavan) broke into the UAE based business man's house on late night of Monday. Noticing the suspicious activities, the neighbors alerted Younus's ( UAE business man) relatives who in turn notified the police. The police were able to identify Raghavan with the cctv footage provided by the family. The cctv footage also showed Raghavan wielding an iron rod wearing white dhoti and shirt with a bag.It is still not clear about the missing valuables. Dahua Parking guidance system adopts advanced video analysis technology which supports, parking space indication,searching vehicle by license plate and illegal parking alarm. Gold Jewellery Stolen, Caught on CCTV Cameras. The incident happened in Rajasthan when a couple visited a jewellery shop. They stole jewellery when the shop owner was not around. The video was recorded in the cctv of the shop. It was afternoon time when a married couple entered the shop. The husband was a good friend of the shop owner and always preferred buying jewellery from a long time. The incident happened in Delhi when a family was assaulted at a famous club. It was captured on cctv cameras and the Verma family reported the matter to the police station. It was in the evening when Arvind Verma along with his whole family went out for dinner to celebrate his marriage anniversary. They had reservations about the place but they had also read some good reviews on Zomato and thought of giving it a try. It was all good when the family was having dinner, later when the kids and teens decided to hit the dance floor, is when the problem started cropping in. The murder happened in Ludhiana when a man killed his elder brother. The murder in Ludhiana was caught on cctv. The Ludhiana police department took charge of the case. It was morning time when Kuljit Singh took his elder brother on a drive. They were having a conversation in the car when he parked the car and stepped out of the car. He was accompanied by a stranger who together fired bullets. Bhupinder Singh, the elder brother was shot dead. The murder was captured in the cctv footage, when Ludhiana police found out they arrested his younger brother. The police acquired all the details from the car and his dead body was sent for post-mortem. Police investigation department stated that Kuljit Singh killed his elder brother for money. Bhupinder Singh was a non resident Indian; their father had made a will where maximum percentages of shares were allotted to Bhupinder. Kuljit had ego problems and was envious of his elder brother that led him to take this step. Chain snatcher in Mumbai caught on cctv footage. The incident took place on Sunday morning at Dahisar sports complex. An art exhibition on Sunday where thousands of people gathered was a celebration day for various artists and the function was especially held for their felicitation. The female staffs were at the entrance gate when one of them was having a conversation at the security guard office. It was Saturday night at 1 am when a man jumped off Worli sea link road, was captured in CCTV cameras. The man committed suicide due to his failed relationship with his wife. The man, aged 35, married, lived in a Byculla locality, with his wife in a nuclear family. He separated from his parents due to facing opposition regarding his marriage to a Muslim girl. The couple started facing problems three years after marriage when the man started suspecting his wife which turned out to be true. The incident took place in Chicago where an officer was shooting a Lanquan McDonald 15-16 times. The whole incident was captured in cctv cameras. It was sad to see and people were quite sentimental about it. It is something that people didn’t really encourage about. The video showcases an officer firing gun, but this is something that the people have been waiting for the protest. The accident happened in Dubai at a petrol pump. The car got half burnt while the driver was safe. The whole accident was captured in the cctv footage. It was evening time when a car drove to a petrol pump, the driver asked the person to fill in the full tanker. That’s when it caught fire due to high temperature and caught fire. Fortunately the driver ran out of the car as soon as he realized he saw the fire. The petrol pump immediately sprayed the fire extinguisher on to the car. The incident took place in the afternoon when a girl was kidnapped by a group of people and they rushed from the parking lot as soon as possible. The entire kidnapping was captured under cctv cameras. It was afternoon time when Sara who belonged to an affluent family in United States was kidnapped. Apparently she went to the shopping centre for shopping. Her driver dropped her by the centre near the parking lot of the shopping centre. The incident happened in South Africa at a petrol pump when two men attacked the staff and threatened to kill them. The staff was very scared and couldn’t do anything about it. They let him take all the cash with him. The entire robbery was captured in cctv cameras. The thief threatened the entire staff with a gun and also tried to harm them. Two guards were shot and five were wounded by the thief.The thief was accompanied by another guy who even stole a car by threatening the driver. The robbery happened in India where a couple of goons entered the factory and stole huge sets of television in bulk and left. The whole robbery was caught on the cctv cameras of the factory. It was 2 am in the night when a couple of thieves entered the factory very smartly and were trying to open the gate. They managed to open the gate and started getting all the television sets outside and were seen placing them in their car. The robbery happened in Lahore at a local jewellery shop, the staffs were killed and the shop owner was injured. The whole act was caught on cctv cameras of the store. A group of men entered the store as customers. Nearly after 5 minutes, he attacked on the staff and threatened him. He even tried to slit his head but the staff pleaded in front of him. Later, the thieves started to gather all the diamond pieces into their bag. The incident took place at a state bank in India where a group of thieves entered and stole all the cash and ran away. The whole incident was captured in cctv camera of the bank. It was morning time when people were busy in the bank; suddenly a group of robber entered and created a mess all over the bank. They fired guns and were seen threatening people. Some of the bank staff was even killed. A new born baby was kidnapped from Surat civil hospital. The woman took the 3 day old baby and was seen leaving from the hospital. The cctv footage is present with the hospital authorities where she is clearly visible. The parents of the child are unhappy and saddened by the incident and have filed a complaint against the hospital on their careless attitude and questioning their responsibility. The hospital is trying to figure out the culprit and have reported the case to the police investigation department have stated that it must be due to some personal rivalry that the child went missing. The incident took place at CST Mumbai when a 3 year old child was kidnapped by a stranger. The whole incident was captured on CCTV camera of the station. There were passengers sleeping on the platform when a random guy stepped in and sat where the visitors were sleeping. The incident took place at a school in China where earthquake occurred. They were evacuated immediately after the school authority monitored on the cctv cameras that were installed into the classes. The teachers were taking classes in every division when the earth started shaking and the children were very scared and were clueless. The school staff decided to evacuate the students out of the school. Fortunately after a while the earthquake stopped and the teachers could breathe a sigh of relief. The incident happened in Haryana when a woman was caught stealing some ornaments and money. She was arrested by the police within 3 days when the family reported to the police station. The lady thief was staying with a stranger family since 3 days because she had no option and there were problems of riots going on in Haryana. The stranger family helped her and gave her a shelter for some days. She did not hail from Haryana. One day when there was no one in the house while the maid being outside in the garden of their house, she was searching for stuffs in the bags and she stole some cash and belongings. The entire footage was captured through cctv that was installed inside their house. She was about to leave the house when the family returned back home. Post dinner they found out that some cash was missing and they suspected the lady living with them. They checked her bags and they were shocked. They immediately filed a case and the lady thief was put behind the bars. Later through police investigation they found out that the lady use to rob at several houses by staying at their place and migrate from one place to another. She shifted to Haryana for the same reason but failed miserably. A group of twenty biker gang attacked a restaurant in Texas. The whole incident was captured in the cctv camera of the hotel. The matter was reported to the police station as many people were dead and injured. It was morning time in Texas when gangs came in for a shootout. The biker gang started shooting the restaurant insiders. The hotel staffs were unable to do anything. The incident happened in a family jeweller shop when a customer entered there and robbed some jewels but the owner caught him in no time. The whole incident was captured in the cctv camera of the shop. It was evening time when he entered the shop. There was no one around except for a small buy of the shop owner. Initially he was checking out some designs. He was also playing with the kid and was trying to be friendly with him. The man took undue advantage of this, and opened the drawer when the shop owner went inside. eSSL security systems provide you a technology that is standard and one of its kinds. The systems are well designed and customized for your business. Every model has its uniqueness and caters to your needs and demands. The world of technology with its access has increased and has been gaining huge momentum with India being in the forefont. The system is ideal for house, factories,educational institutions, vital infrastructure, transportation, factories, office etc. The video showcases Dahua camera being installed outside at a parking area in United States. The advanced performance and technology is something that is incredible. It also the night vision camera where everything is so crystal clear. Dahua cameras can be installed inside your house, educational institutions, vital infrastructure, transportation, factories, office etc. The security based system offer you quality products and meets your expectation in every way. Two ladies were caught on cctv cameras in a shop when they tried to rob a gold necklace piece. The incident happened in Kerela. The cctv footage played a huge role in finding the lady. It was afternoon time when two ladies entered the jewellery shop. They had come to take their gold earrings and chain which they had given to the owner to make a customized one basically. The incident took place in Chennai when a group of buglers were seen threatening two girls standing outside bungalow. The incident was captured in cctv cameras of the house outside gate. It was an evening time when two girls were chatting outside her house. The girl had come to see off her friend outside her bungalow and was talking for a couple of minutes when two men on a motorbike passed from there. They stopped the motorbike when they saw the girls. The incident took place in South California in the afternoon when a clerk of a gas station fought with thieves and managed to arrest them for their deeds. The whole fight was captured in the cctv camera outside the gas station. Apparently the gas station clerk’s associates were being harassed by a couple of goons at the back of the gas station. It was afternoon in Gujarat when the incident took place at a shop. The robbery was captured in cctv cameras and the lady was caught immediately. A family entered a showroom where they were looking for a laptop. They were initially looking for televisions but they were too expensive and nothing really excited them. So the couple decided to purchase a laptop. The incident took place in Mumbai in the afternoon when a man robbed a couple of gold chains and ran away from the jewellery shop. The man was unable to find unfortunately. The whole incident was captured in cctv camera. The man visited the jewellery shop and was checking out some gold ornaments. He asked the shop owner to show more of gold chains, the sales girl started taking out some chains and was showing him the latest ones. It was evening time at a Delhi metro station when the incident happened. A girl jumped in front of the train and committed suicide. The death was captured in cctv cameras of the station. The girl hailed from Delhi and was about to have an arranged marriage. She was well educated and independent woman. The groom’s family demanded more dowries for marriage which was not possible for the family of the bride. A group of four women entered into the snack store and managed to rob cash of 30000. They were casually dressed, middle aged pretty women who exercised crime in no time and left from there as soon as possible. The owner of the shop was in the conversation with the women when one of them tried to rob the money. Three women were caught on cctv stealing a couple of bed sheets and clothes from the garment shop. They managed to hide and leave but were caught the same evening by the police when they received a complaint from the shopkeeper. The cctv footage shows three women entering into the garments shop when they check out a couple of things and wait for the right opportunity. Later one of the ladies put 5 to 6 piece of clothes into her bag while the other ladies steal a couple of bed sheets, they hide some pants into their saree as well. Essl x990 biometric time and attendance is one of the most preferred security based systems which is quick, simple to use and is very convineint. The biometric time and attendance records the present and absenteeism of people and provides accurate information providing standard quality access control system. The system can be placed in offices, educational institutions, hostels, hospitals, vital infrastructures, transportation etc. The system enables to record the attendance of the employees as in when they enter and exit and their timings. A girl named Jyoti who worked as a salesgirl in Jaipur was found stealing diamond jewellery worth 25 lakhs. The entire incident was caught on the cctv camera but she managed to run away from there. The security guard even tried to stop her when she went out of the shop by saying that she would return in 10 minutes. The shop owner filed a complaint against her in the police station when they found out that her identity and address is fake. Dahua is a professional manufacturer in providing security based systems. Security kart provides you the best of Dahua cameras which are simple and convenient for use. The security based systems can be installed in educational institutions, hospitals, hotels, factories, homes etc. They provide you standard quality security systems which are worth it and leave up to your expectations. The video shows how can you operate it and keep a watch on every moment even when you are not around. The cctv cameras are installed inside the bus. It could be viewed live easily by Principal, school transport or fleet manager which can help in monitoring and controlling any illegal or misdoing activities going on inside the moving bus. With the help of these security systems, the school authorities can keep a track of the children from the moment they leave home till they reach school. The school authorities can take strict action against any illegal or unforeseen happenings or any kind of harassment to children. The incident took place in Pakistan at a jewellery making shop in the evening. There were two jewellers sitting and chatting in their shop when the goons entered. Initially the gun firing happened and they tried to break all the properties and cupboards. Later they attacked the shopkeepers, threatened them and got beaten up by the assailants. The two attacker’s faces were covered and carried gun with them. The killers were beating them up and after some time they started putting the ornaments and cash from the cupboard into their bag. The incident took place at a restaurant in Italy. The men were murdered by the mafia members in no time. Since it was morning time, not many people were present in the restaurant. There was a girl at standing at the bar and the men were seated on the couch. The mafia members sat beside them. They were having a conversation with the victims for a couple of minutes. When they got up, they fired guns at them and left in their car. They didn’t kill or tried to threaten other people and immediately ran from there. The incident took place in Paraguay where a famous businessman was shot dead outside his house. The two men initially approached him and attacked him by gun shots and stabbing him a couple of times. He was brutally killed. The police investigation department found out that it was such a petty issue due to which a person lost his life. Apparently the businessman sold a car to one of his dealers. The two had a word with each other about it and decided that the dealer would pay him on monthly basis. The incident took place in Honduras, a city based in central America. The police asked the motorbike drivers to park the bike at a side and have a word with him. The goons were seen arguing with the police officer. They were backanswering the constable. When the police was attending a call, the goons took undue advantage of his, and removed a gun and shot the police. The other goon caught hold of the police and tried to fight with him on the road. the crowd was completely scared and cluless. Unfortunately the police was hsot dead and the goons ran away from there. The incident happened in London when on the roadside couple of people were walking by the road, when a car entered and killed the two people by triggering gun shots and left immediately. The whole incident was captured in the cctv cameras. A man was a little away from the victims, but he couldn't recognise or make out wheather they are injured or even visible. After 5 minutes, crowd gathered to see the victims. They called the nearby police station immediately and the victims were admitted to the hospital. Unfortunately one of them died and the other one is out of danger. Securitykart provides you CP plus cameras which gives you a high definition video interface systems on a large scale. The security system has been gaining huge momentum with India being in the forefront. The technology advancement has improved and CP plus is a living example. The security systems are ideal for your homes, infrastructure institutions, hospitals, educational institutions, factories, small/large businesses etc. The clarity of the video footage is good while the devices are simple to use and convenient. The video showcases the customers buying from the store. Security kart comes up with various CP Plus cameras that can be installed in government buildings, vital infrastructures, transportation, hotels, hospitals, educational institutes, homes, with highly satisfied customer base. CP PLUS is a trendsetter in terms of technology shift in security Industry. CP PLUS fits into any security architectures, while keeping pace with future technological advancement. The security based system can record consistently without any failure, in Indian weather & road conditions. It can well provide evidence of traffic accidents, arson & attacks etc. CP Plus is a security based cctv cameras ideal for your business and society. Live in an environment where there is no stress or fear. Security Kart brings you an art of piece which stands out in every way. The video showcases the footage of a building where the visitors are captured into the cctv cameras. The picture and video of the visitors are so crystal clear. The security based system can be installed anywhere in your locality to avoid theft and other unfortunate things taking place. Security kart brings you CP Plus, a market leader in the world of cctv. The security systems provide you peace of mind no matter where you are present. The advertisement wherein a group of boys are seen bullying other guys. They make them do certain things which gets captured in the CP Plus cameras. The ragged guys point out the cctv cameras and try to say that their acts are being recorded. The boys who were ragging are seen running away from there. CP Plus is one of the most preferred security systems that provide quality products for your families and business. The level of performance and features gives it an opportunity to try and it lives up to your expectations. Securitykart is associated with CP Plus aiming to provide you a secure environment. The funny video showcases a guy ogling at a girl at a local shop in Delhi. He is trying to intervene in whatever she is thinking of buying or looking for any purchase. Essl security is an elevator access control system which is economical and possess qualities of advanced performance. The system is quick and easy to access. Imagine you are stuck in your building or office lift, what would you do? Trying to press the floor button but doesn’t seem to work? Don’t worry, if essl elevator access control system is installed in your lift. The video shows how the eSSL iface 302 face recognition system can be used for your business. The device scans your face and exercises the verification process while entering your office, through which it also records and maintains your time and attendance every day. Essl time and attendance system is a one of its kind brought to you by securitykart. The device is specially customized for office hubs, machinery, small/large businesses, healthcare sectors, schools, colleges etc. No more book keeping record of your employees at office, essl device provides everything that you are looking for your business. eSSL Biocam300 time and attendance system with cctv surveillance is a latest in the slot. The product is a facial recognition high definition camera and also enables to calculate the time and attendance of the employees. The Essl system is an updated technology that needs to be explored more because of its features and access. eSSL identix excel is a one of its kind fingerprint time and attendance system that is ideal for your small and large businesses. The system is portable, easy to access and at affordable prices. The finger print time and attendance system scans your finger and records it. While entering into your office, all you need to do is place your finger on to the machine and and within a fraction of a second, your attendance is done. Essl security is one of the leading companies providing biometric time and attendance systems and security based systems. We offer a wide range of security based systems which can be easily installed into your homes, machinery, hospitals, and educational institutions and for small and large businesses. The video shows you how you can easily access the machine. The system is very useful for recording the time and attendance of the employees in the organization and teachers and students in schools and colleges. The incident took place in Hyderabad at a market where a woman with her baby was shopping for groceries. A man was roaming around the market for 10 minutes. Later, he grabbed the opportunity and kidnapped the child and went into his car. The mother of the child felt helpless at that point of time. She immediately reported to the police station, the department is on the verge of finding the kidnappers. The woman even received a call from the kidnappers who demanded 50 lakhs. An infant girl in Ludhiana was apparently killed by a car driver in the evening 8 pm. The girl was playing with her cousins at a park with her parents around her. All were having a family time when this unforeseen happened. The child’s parents were mute and deaf and they were talking other couples in the park. The infant girl came out of the park to pick something up on the road. The car driver was taking a reverse when the child came under the car and died there itself. The aggression in Gujarat has intensified over the issue of reservation demand by the Patel community. The centre has hurried in personnel forces as also to control the deteriorating law & order situation. The police constables and officials didn’t really bother about anything and were recently caught in CCTV cameras breaking the window glasses of the vehicles of the residents. The CCTV footage showing the police involved in damaging private property went viral on social media. An affluent couple from Mumbai was seen throwing their girl child into the trash. This was so annoying to see that today’s educated people are doing such gross things in today’s era. It was recorded under the cctv surveillance camera. This just shows that it is so difficult for a girl child to be born in India. As soon as they went into their car and were about to leave, some people noticed this and tried to stop their car. The people started beating up the man for doing such inhuman thing. The garbage man took the girl child out of the trash and handed over to the police station. The couple was arrested too. The recorded footage and the charges of female infanticide were levied on them. It is because of the societal and family pressures that the girls are killed inside the womb, it is our responsibility as an individual to wake up the society and make them realize that they are heading onto the wrong path. It was morning 10 am when the accident took place in Kolkata in the middle of the road. A woman was shot dead by the bus. The bus driver was so careless that he didn’t even bother to horn and ask the lady. The police caught hold of the culprits involved but couldn’t find the bus driver as he eloped after realizing that the constables were looking for him. The victim was a mother of four children and a widow. The incident was captured on cctv cameras in the midst of the Film city area. Two men were on the bike and closely fired bullets into Raju Shinde who was present there. He runs a cable, television network, construction etc. Rakesh Rao who was the owner of a well known dhaba in Gurgaon, Delhi was shot dead by three unidentified men. The incident happened in the morning when he was at his dhaba. The men were on their bike outside the dhaba. They called him up and fired five bullets into him and ran away from there. This was captured in the cctv cameras. The crowd took him to the hospital, unfortunately while reaching the hospital he was dead already. The police investigation has been given the case to handle. The cctv footage is of great assistance for the investigation. The case against the unknown assailants has been registered on the complaints of one man who was present at the time of incident. The incident happened during the night in Rajasthan when a group of youngsters were bashing the old man like anything. They were dragging the old man and beating up with a hockey stick. The family of the old man reported this to the police and the police took the case into account. The cctv footage was an evidence showed to the investigation department. The old man named Radhesham is basically has a small shop of Paan where these group of college going students use to visit him. It was 9 pm in the night when the murder happened. A man stepped out of his car and went towards another car and was gunshot within a fraction of a second. The murderer was a dealer who killed the man for property. The murderer and the victim were business partners few months ago when the differences in their business started cropping in. The victim owned a large number of properties in Gurgaon, Delhi which everybody knew. The alliance got terminated after a couple of months. It was at a hospital when such insane things were happening. The UP police constables met a patient in the hospital. They were having some conversation with the patient for about 10 minutes. Later they sent the doctors outside the room deliberately. The doctors didn’t listen initially, but later on they were forced to leave. The police men were forcing the person, beating him up, throwing water on his face, and physically abusing him. It was in the afternoon time when the incident took place. The woman was accompanying her daughter to school. They were walk passing the lane when within few seconds a two guys on a bike entered and one of them snatched the chain and ran away. The cctv camera captured the incident and the constables are working on the case. These chain snatching incidents are increasing day by day especially in a place like Virar where people feel very insecure even when they are with their families. The cctv footage recorded was telecasted on all the channels across the globe. The ministries have decided to take extra precautions regarding pre and post disaster management steps to avoid ugly deaths and injuries to the common man. In the middle of the busy streets of Ibrahimpatnam, a middle aged lady entered into the shop. The shop consisted of jewels, clothes and other cosmetics. The lady was roaming and looking out for something when she asked for one of her staff to show some neck pieces. While she was checking out the necklaces, the sales girl went out to for a second. This was the time when she immediately put one of the necklaces set into her bag and left from there saying that she isn’t interested in buying anything. It was in Kochi when the incident happened. Two women were seen having a conversation in the middle of the road. Their conversation went up to 10 min. Two guys on pulsar entered there out of which one of the guys stepped out and asked the woman who went inside her house. She stepped out of her house. The guy was talking to her for 5-10 minutes asking her about some address. When he was leaving, he suddenly snatched the chain and ran away from there. It was at night when the incident took place; three goons entered the ATM bank in Hyderabad. There was no one around, even the watchman wasn’t present at that point of time. The goons seemed very experienced in what they were doing. The latest development in the educational structure is not for the students but for the teachers. A biometric attendance system will now be installed in the government schools of Uttar Pradesh. The step has been taken by the government to keep a check on the teachers. Biometric time and attendance system provide you services that are ideal for educational institutions in particular as it helps to keep a check on the attendance of teachers. Development and Housing & Urban Poverty Alleviation M Venkaiah Naidu made a surprise check of Nirman Bhawan to find many officers and junior staff missing from their seats during office hours and a set of instructions and checks were issued on Monday for monitoring attendance of employees and ensuring efficiency. Many section heads and supporting staff were absent at work. The names of the absentees were written down. From now, immediate actions will be taken who report late to office. Mr. Naidu has thereby decided to install biometric attendance systems so that the time and attendance will be recorded of every employee easily. It was afternoon time when 4 ladies entered into bag shop. Three of them were middle aged women while the other one was an aged woman. As soon as they came in, the staff started showing various bags to them. The aged one was roaming inside the shop and when she noticed that the staff was busy with the three women, she quickly opened the drawer and put all the cash inside her dress. It was afternoon when the incident happened. A jeweler in Meerut was attacked severely by a couple of goons who entered into his shop. They wore helmet so the cctv couldn’t recognize their face nor the owner of the shop. The incident took place at a shopping mall in Sri Lanka where people were busy shopping. There wasn’t much of a crowd, while the visitors were mostly females. A guy entered and suddenly stabbed a girl couple of times. The crowd ran away as they were very scared. Within 10 sec the manager of the shop came and saw the girl. He was deeply saddened and shocked. It was a temple in a local area in Gujrat where the incident occurred. The small temple is usually where the crowd visits when they pass by and is open 24/7. It was during afternoon time at 3 pm when nobody was present and that’s the time when three men entered inside the temple. One of the guys got off the gold chain and the other two were trying to pick the big money box which was placed at the front inside the temple. The incident took place in Ludhiana wherein a pet dog was stolen by a couple. The owner of the pet dog was out for a walk and that’s when a couple stole it from a park nearby gurudwara. The owner of the pet Mrs. Komal Ahluwalia reported this to the police station and acquired the cctv footage of the gurudwara where the couple had visited. Later, she got assistance from other business establishments in the area which made it easier to identify the woman. It was morning 10 in Bangalore when the accident occurred. In the midst of traffic road when everyone was busy pressing their horn buttons and wishing to move as fast as possible. There was a group of college rowdies. The boys were creating more mess by constantly horning and making the crowd feel irritated by their silly acts. The police constable couldn’t do anything as he was far away and busy managing the crowd in the traffic. The train from Bhayendar went over the buffer and climbed the south end concourse at churchgate station. It was a fast train and the incident took place suddenly. It was captured in cctv cameras. The passengers in the train had minor injuries while the train driver was badly injured. The people were worried and petrified. India’s Punjab University will soon launch biometric time and attendance tracking system for campus staff. It will be used to track the non faculty staff and also track the attendance of the students and teachers in the future. The system has been implemented to deal with irregularities in the attendance of the university workers, and issues relating to non students entering into the college universities. Biometric time and attendance tracking is on the rise with India being on the forefront. The incident took place at a mobile store in Pensacola where the man was seen attacking the woman. The woman was alone at that point and the man entered in. He attacked her directly, pushed her on the floor and was seen beating her up. He took the cash from her drawer and left immediately. It was during afternoon in Kochi that the incident took place at a mobile store. The man was casually dressed and entered the store. He was asking for various latest phones. There was only one man present at a store and the other staff was busy with other customers. The thief took undue advantage of this and ran away from there. The incident took place in Mumbai where 3 men stole 8 lakh rupees within few minutes and ran away. The robbery was done from Central Bank of India. It was 11 am in the morning when the incident occurred. There was rush in the bank when the three men entered, very casually dressed. It was in Thane that the incident took place at a jewellery shop during the peak of the festive season.The owner and the salesman were busy with their customers and busy tallying the sales. It was later through their cctv footage, they noticed that a woman stole a gold chain worth rupees 26000 which the owner was looking for. The incident took place in Gurgaon, Delhi wherein 4 people on two bikes landed at a petrol pump and attacked a guy named Raju who apparently had gone to Gurgaon to deliver a Diwali gift. One of the two assailants got a rifle out and the other one pointed a gun against the victim. They eventually killed him and ran away from there. Dahua-DVR2108C-V2 is a high definition recording sytem ideal for home monitoring and small businesses. The dvr high definition recording system is highly used nowadays thus, changing the definition of surveillance and taking it to a whole new level. Dahua-HCVR5416L is a Dvr hd brought to you by security kart and its the latest one in the slot. It brings you into a whole new world like never before providing its customers an amazing experience. The hd video recorder provides you a high definition image and you can even zoom the image while recording. Dahua-CA-FW191RP is a cctv and surveillance system that captures every moment and gives you a beautiful experience of security and safeguarding. The cctv and surveillance camera can be placed at indoor and outdoor locations. Many a times there are instances when you feel the need to make your environment and your loved ones feel secure and it provides you exactly like that. Dahua-CA-FW181D-B is a cctv and surveillance system that is one of its kind brought to you by security kart exclusively. The surveillance system can be used exclusively in petrol pumps and jewellery shops in particular where the crime and theft is taking place on a large scale. Dahua-CA-DW191H-IN is a cctv camera that is brought to you by security kart that looks unique and powerful. The cctv cameras are so important nowadays for security of the people and the environment you are living in and this system gives you all that you want. DAHUA--CA--DW191RP--IN is a cctv and surveillance system that is brought to you by security kart. In today’s time, crime is taking place anywhere whether houses or public places. People need to be cautious about the environment that they are living in. DAHUA---CA-FW191DP-IN is a cctv and surveillance system brought to you by security kart specially customized. Security kart is known for providing standard security and its main priority is its customers, their happiness and satisfaction. This cctv and surveillance system can be placed and accessed in offices, schools, colleges, factories, hospitals etc. Dahua CA-FW191GP-IN cctv and surveillance is a system that is meant for the security of your family and organisation, brought to you by securitykart. Surveillance cameras are extremely important today as they help us track and record the movements around us. CPPLUS-CP-QAC-TC90VBL6 is a cctv and surveillance system that is brought to you by security kart for its customers. Gone are the days when you need to constantly keep an eye on people and the fear of any unfortunate happenings. The increase in crime and theft has inherited a sense of fear in the minds of people.You can’t run away from the situations at times and have to deal with it. CPPLUS-CP-QAC-FY70M is a cctv and surveillance system designed for its customers who are looking for security round the clock. The system is uniquely designed and very different from its other CP plus products. CPPLUS-CP-LAC-TC72L3A is a cctv and surveillance system that is ideal and safe for your locality and families.It records the crime taken place at anytime, anywhere and everywhere. Nowadays the reasons for utilizing these surveillance systems has increased on a large scale due to increase in crime, thieves, and any unfortunate incidents taking place, so to avoid this, this cctv camera is the one for you. eSSL VF300 attendance system is a one of its kind product which has a touch free access i.e by way of scanning your face. This face recognition system Security kart comes up with another addition of time and attendance system with unique features and is particularly customized for its employees.Whether large or small businesses, factories, educational institutions, navy and other manufacturing companies by being user friendly and convenient. Surveillance cameras are extremely important today as they help us track and record the movements around us. Cctv cameras are all around us and give us a sense of security at times, with the perpetrators knowing that their actions are being recorded. CP Plus is the global leader in advanced surveillance and security systems and it has a beautifully designed product. CPPLUS-CP-UAR-0401P1-C a digital video recorder system suits versatile purposes and various environments. Dahua-SD6C120I-HC cctv and Surveillance is apt and essential for office hubs, huge manufacturing factories, seaports business, healthcare and educational sectors. This analogue product is inexpensive and is quicker to install with minimal network setup and configuration and is thereby easy to maintain. The system performs much better in some environments including dark and low light areas. Security kart brings to you Dahua-Hac-HDBW1100R-VF cctv and surveillance system that provides you full time security and a stress free secure environment around you. Banks and shops equipped with Dahua cctv cameras give the customers a sense of security and safety. Dahua-DH-HAC-HFW1000RM is an analog and cctv surveillance system that can protect your staff physically against violence from customers. At the same time, it can also protect them against false accusations - perhaps coming from colleagues or even from client and customers. Nowadays all the businesses and the commercial properties need security 24/7. Due to crime increasing and burglaries at very common places, it has become very important to consider the security options and choose that is best for you. Securitykart comes with yet another Dahua product knocking at the door i.e Dahua Dh-hac-hfw1100dp-b. This cctv and surveillance system can capture the happenings round the clock. The videos can be recorded and circumstantial evidence can be captured whenever needed. For instance, a gang of men barged into the jewellery store and snatched the gold chains and other ornaments. Dahua-SD401121-HC is one of the popular devices used for security purpose. Nowadays crime or accidents takes place anywhere whether its houses or public places. People have to be cautious about the environment that they are living in. This cctv camera is very useful during some unfortunate incidents taking place but one need not worry as this product can record the incidents taken place and the evidence can be taken whenever you want. CP Plus CPPLUS-CP-PVK-70M1 is a combination of functionality and aesthetics brought to you by security kart which is personally customized for buildings, offices, factories, and huge organisations. Nowadays there is a problem of security everywhere whether in residential apartments, villas, office hubs and other factories. A device which safeguards the people around you round the clock is so essential in today’s time. Tired of juggling with the keys everytime you enter your hotel rooms, homes and cabins? eSSL L5000 is a latest one in the slot of security kart bringing a whole new experience of technology for its users. This device enables you to open the doors of your bedrooms, hotels rooms or office cabins in seconds. The device is designed for residential properties in particular. eSSL BL100 is one of its kind products that scan your finger before entering inside the house. The user identity is verified and recorded. No unknown person can enter into your space and harm your family or environment in any way. Essl K21 biometric time and attendance system can be used in educational institutions, factories, hospitals etc. It is crucial for educational institutes to track and record demographics, educational performance, attendance, extra co-curricular and placement records data. They also need to closely monitor the financial planning and budgeting process, faculty data and other operational data. eSSL identix excel is an attendance system designed especially for educational institutions, corporate, fitness clubs and production management.There are no two opinions on the importance of the data. For a large corporation to gym and clubs, data is an asset and opportunity for enabling innovation and creating new business models. Schools, colleges, universities and educational bodies across the country holds humongous amount of data related to students and teachers which can effectively be analysed to uncover insights that can boost student achievement and improve operational effectiveness of the educational institution. eSSL Identix SF100 the biometric system is utilized in schools, fitness clubs, colleges and hostels to substitute physical verification and monitor realtime attendance of every person. This new system has been mulled because especially in hostels currently students have to sign the register as they enter the hostel after the deadline and if anyone is absent, the caretakers/wardens go for physical verification for cross-checking if he or she is present or not. Securitykart comes up with a slick piece made ideally for enterprise, banks, factories, and commercial markets. Security kart comes up with another addition to the time and attendance slot, exclusively designed for its customers. Don’t need to worry anymore from now onwards as we have brought to you eSSL K200 time and attendance RFID system which saves your time, money and energy. A method of biometric identification is not new, however in India it is still raw. Apart from creating awareness about the same, making this technology available for the common masses is the need of the hour. Security should not be mistaken for luxury; in fact it should be treated as a necessity. And our company is completely in sync as Essl X628 device is one of its kind. Security kart has in store a wide range of products providing better security control and identification assurance. eSSL S1000 time and attendance system is ideal for project purpose. The device defines elegance and class. Portability and efficiency are essential and works quite well due to its user friendliness and flexibility. This time and attendance system tracks the absences on the project round the clock. It is very convenient as the number of people working on a field project or any kind of project consisting of innumerable employees and this system performs the task of recording the presence or absence of the working groups smoothly. eSSL-MT 100 is an exclusive product from the securitykart that cannot be missed. The device is a well-designed for recording time and attendance through fingerprint access control. eSSL-DS 100 is customized to satisfy your security needs for your people and for your organisation. The biometric attendance system checks and records minute details of the employee’s movements throughout the day in corporate environments. No more book keeping and calculations in your businesses. Save your time and energy by getting the exclusive device from securitykart. eSSL Iclock 990 is a time and attendance with access control system device from security kart which is safe and reliable. The product has the ability to scan and verify the person’s identity through passwords and fingerprint. The device is very useful for colleges and universities, office hubs, government offices, scientific labs and multinational companies. Securitykart brings you one of the most convenient and easy to access biometric time and attendance system which can be installed even in outdoor locations like parks, garages and indoor locations like factories and government offices etc. eSSL multi bio 700 is the biometric identification system that has the capability to verify the person’s identity in 20 different ways. The device is specially designed for face and finger recognition thereby creating a template to verify each user. eSSl iface 301 biometrics technology analyses, identifies people which can be used for security and identity verification purposes. The system is a fast, accurate and reliable solution that is suitable for especially dark environments. Essl-i9c Time & Attendance controls and manages your employees’ attendance and simply finds out their in-time, out-time and the total number of hours they worked and capture every entry and exit data of your employees and automatically calculates the total number of hours worked. Dahua-IPC-HFW2300SP-V2 is another addition well designed and customized for security purpose. Nowadays these devices have been used on a large scale especially in schools where teacher’s absenteeism can be recorded timely. Since sometimes there are false allegations on teachers for their behavior towards the students, the actions can be easily recorded through such devices and actions can be taken respectively. Dahua technology is a professional manufacturer in the security and surveillance field offering a wide range of products catering to different markets and masses. Securitykart introduces you to DAHUA - HAC-HDW3103CP which is the latest one in the slot offering you accessibility at all times. Whether placing them in the buildings, office hubs, educational institutions, the device is highly recommendable. Essl K30 is another addition to the Identix security consisting an inbuilt battery backup. The device is customized for small businesses and organisation. Data can be transferred easily.Automatically recording the employee’s working hours, attendance and capturing everything within the office or other places where its deviced. Small enterprises have started using ESSL K30 considerably as it not only has the value for money, but with great operating system it runs smoothly and efficiently. ESSL X990 is an innovative biometric fingerprint reader for Access Control and Time Attendance applications. The device can be used in schools, colleges and hostels wherein during examinations instead of writing all the details about the student, one can just scan his/her fingerprint and finish the respective formalities within a fraction of a second. eSSL F18 is determined to leverage the usage of fingerprint devices. Low price and product efficiency has given boost to these products to a larger extent. Places like office, laboratories, and corporate houses have access to such fingerprint devices and has been increasing day by day. ESSL SC 405 is specially designed for the international high terminal access control market to substitute multi door controller concept. IT companies in particular, have greater access. Coming up as an evolution in access control hardware solutions, these products have succeeded in terms of its use in IT infrastructure thus leveraging the product sales, thus you can observe its major chunk of revenue coming from these companies. A multi biometric identification Time and Attendance and Access control terminal, its standard functions include self service query, 9 digit user ID, automatic status switch, work code and T9 input. It provides Mifare Card [chips used widely in contactless smart cards], WiFi[a facility allowing computers, smart phones, or other devices to connect to the Internet or communicate with one another wirelessly within a particular area.Gprs and short message. Dahua cctv camera clarity : Please view the video in 720p on YouTube for real video clarity. If a CCTV system is to be used by police, post crime, the combination of the cameras and lenses plays a vital role in identifying the person/people involved in the crime. Camera and lens selections need to be chosen and based upon a 1.7 meter ( 5.5ft) person. Please note that unless a Camera achieves ‘Recognition of a Known Person’ it is unlikely to be used by the police to identify a person for prosecution in a court of law. Indian police have stated that over 90% of the video evidence that they collect across India fails to meet the required standard. Please refer the below chart prior to buying a CCTV system. Auto-iris allows the camera to control the lens iris to adjust for varying lighting conditions. There are often two related options as well, DC and Video - DC means the camera actually controls the iris, Video means the camera only supplies power to the lens, and a sensor in the lens controls the iris. After a year of R&D, eSSL have finally launched their most awaited fingerprint vein attendance system. eSSL and team launch the device in the recent held trade show at the Indian capital New Delhi. The trade show was conducted by ITPO ( Indian Trade Promotion Organization) a government entity that promotes trade shows across #India. Before buying your home security system, you make a lot of deliberation, compare notes, and check reviews online. However there is still a slight hint that your decision could be wrong. The last thing any home owner looking for surveillance cctv cameras or businesses interested in spy cameras would want to face is a failure of their security system. Although a surveillance cameraoperating for a good few years can give you problems, for a new one to do so is heart wrenching. Especially with new security systems, no matter how hard or long you scream, help is always far. This past decade has been seen a huge transformation in security systems and the technology that’s involved with it. In the times when home security systems were new, they were hard wired and huge, always connected to a dedicated phone-line so that security system viewers had an uninterrupted view of images that the camera captured. Things have changed drastically over the years, we now use 4K cameras with exquisite picture quality and surveillance systems that work over a wireless based system. The way home security systems have changed is only for the better and it is only going to evolve as per societies and business needs.The new set of wireless security systems now store images and videos on the cloud. This gives the user the ability to access the images and videos captured by the camera from just about anywhere in the country or globe. Snipers, 49000 security personnel and 15000 cctv cameras will guard the Capital on the Republic Day! Delhi : Pre-arrangements are made to ensure the safety of the french president Francois Hollande. Post to Phatankot airbase attack and arrest of suspected terrorists, india gears up for the Indian republic day celebration in the capital city of Delhi. Reports says, 1000 snipers, 49000 security personnel and 15000 CCTV cameras are deployed to avoid any sort of security threat. All the personnel will be deployed by 5 a.m on the day of republic. Vododara : After a theft in broad daylight in Sursagar, Police are examining the cctv footage to gather information. Two persons robbed Ramesh Giri of Rs 4.5 lakhs of cash when he was returning to his car parked at the faculty. Mukesh Ambani gets super Armored ! Mukesh Ambani, Mumbai : Reliance Industries Limited chairman and managing Director have bought himself a brand new mercedes Benz S600 for a price of 10 crores (Reported). What so special?, The Mercedes S600 is super armored and a luxury car. It is also said to be that, Mr. Mukesh had recently bought a brand new BMW 7-series which is also armored. The Mercedes packs in more armor than any other cars owned by the reliance Director. The incident took place in Kochi when a girl robbed a mobile phone and left the shop immediately. The video was captured in the mobile store cctv cameras. It was Tuesday afternoon when a college going girl entered a mobile store. The girl’s phone had a defect due to which she had visited to the store. The staff checked her mobile phone and suggested her to buy a new one since the phone’s defect had completely damaged the device. MUMBAI: Seven years after the 26/11 terrorist attacks in Mumbai, the city has got its first integrated security camera network with the launch of the Mumbai City Surveillance Project. Speaking at the event Mumbai Police Commissioner Ahmad Javed said, "These cameras will keep an eye on Mumbai 24x7. This will help the police not only in solving crimes but also in responding to emergencies. We are thankful to the government for implementing the project. "After taking over as Chief Minister in 2014, Devendra Fadnavis had said it would be his priority to get the project implemented as it had been stuck in red tape for years. Securitykart is a cctv camera dealer in Mumbai. We distribute wide array of Dahua products across Mumbai and metro cities in India.For more information, visit us at www.securitykart.co.in or call - 8879099910 ( Sales Manager ). CCTV Dance Bars Mumbai : Maharashtra government had made it mandatory for all dance bar operators to provide live cctv feed to nearest police station to keep an eye on activities at the dance bars. Chief Minister Devendra Fadnavis on Wednesday said, We are not in favor of dance bars but, for those existing, we need to them to comply with all the guidelines for civilian safety measures. Securitykart is the leading distributor and online seller for security based products. We represent world brands and cater to over 5000+ registered system integrator. Gate Automation - Turnstiles with Biometric integration, Flap barriers, Retail barriers, Full height turnstiles. Security Accessories - EM locks, RFID cards, Card readers etc. We enable our channel partners/customers to have an edge in the market in terms of technology and competitive market conditions through live demos, local stocking,competitive pricing, training and technical support. We at Securitykart thrive in achieving our set goals by creating a win-win situation for both our customers as well as our channel parters ensuring business growth.